We review a lot of curriculum offerings, a lot of books...and every now a then we get a fun and unique product to show you like this one from Zirrly. 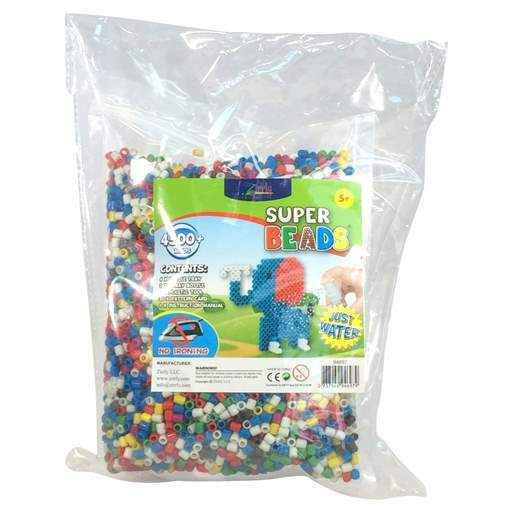 Zirrly offers a plethora of goodies on their site, and one such product is called Super Beads! Super Beads are these little bead like "things" that magically fuse together with a spritz of water. You can use them to create all sorts of different designs and pictures. For this review, we received one Super Beads Mega Pack. Assorted Templates: multiples of the same ones so if you have more than 1 child wishing to work on the same project, they can. I just knew Mr. B would love this! He loves arts and crafts, and he loves beads, so this is a hit, right?! Well, he has had fun with these, BUT...they have a bit of a strange smell to them, and he can't tolerate it at all. So the only time he's been able to play with these has been during really nice, breezy days when we can have the windows open. They smell rather strongly of a glue-like smell, and with his autism that smell is sort of magnified I guess. So use your discretion there if you have a child who is very sensitive to smells, this may cause them some issues. If your child isn't bothered by that, then these are a lot of fun. They are tiny, and perfect to help develop and perfect that pincer grip that some of our kiddos need help with. It's a great resource for fine motor skill and control. You can also use this as a matching game using the template beneath the tray since the child has to match the color bead to the color square to create their creation. The spray bottle offers more in the way of therapy skills since it is a pump style bottle. Mr. B made numbers on his own, planets-that he promptly took from me and I never got a photo of those, and a turtle so that we could try out the templates. The templates were a bit hard for him to get just right. It took a few turns to get them lined up the right way. There are 4 tabs that need to fit in just right, and he didn't like taking the time to do that. The beads also need to be lined up just right for the water to fuse them together-but that's explained in your directions. His numbers fell apart when I took them off the tray (harder to do than I thought, HAHA!) but a little spritz of water and it was all better. These do take about an hour or so to dry fully, so you'll need to be mindful of that. Overall, these are great so long as the glue-like smell doesn't bother you. It didn't bother me. I could smell it, but it didn't bother me. He nearly gagged because...autism. These can be great for therapy use, fine motor skills, pincer grip, and the like, and I would recommend them to others! Check out The Homeschool Review Crew to see what others had to say.